9x servo on Arduino Nano? I saw this project with multiple servos: In Servo We Trust! 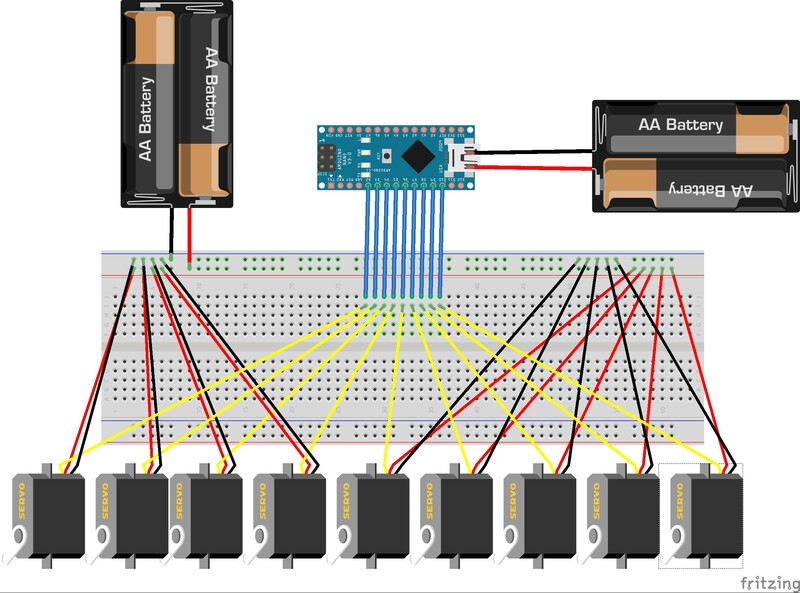 Let's control 135 servos with a single Arduino! I wanted to miniaturize this project. BUT instead of triangles i will use SQUARES. For now project stops, not forever. I bought 9 servos on aliexpress and im waiting for them to be delivered. Also, im making a 3D project in AutoDesk Maya 2018, planning and will sbow you the results soon how im gonna make it work. I was thinking about adding 1 more servo and hc sr06 distance sensor. I was thinking about the sensor will detect person, servos and mirrors will also follow the person. But idk if im gonna make it to the final project. All servos will be powered with electricity from the wall 5V 5A.The servos wont be on heavy load so it will be enough i think.If any problem occurs I will use 10A. ALSO SORRY for not editing this POST earlier. I would like to thank everybody for giving me such a great advices, I will post my AutoDesk project soon. I'm afraid that with PWM controler I won't be able to do that. Chances are that any PWM controller is going to let you control each output independently. According the the servo library documentation, the library can handle up to 12 servos on a single Arduino, so your project should be feasible. It will however reduce the number of PWM pins available from 6 down to 4. Will a 9V battery power all these servos? Typical 9g servos consume 150 mA without any load, and stall at ~700-900 mA. A typical 9v has ~500 mAh capacity, and most data sheets show loads of ~100-150 mA max. Your 9v might be able to supply a few amps for a few seconds before they heat up and slow down. If your load is very light 9 servos will consume ~900 mA; an ideal 9v would last at most 30 min with this load, but real batteries aren't ideal and will heat up and loose efficiency. Near maximum load your 9 servos will draw ~7000-9000 mA, well beyond the capabilities of a 9v. However those numbers are for 5v so you could cut them all in half. If you used an appropriate 5v step-down DC-DC supply you might be able to power all 9 servos for a few seconds before the batter overheats and gives up. If you powered them directly, the servos will have to dissipate more heat, and will draw extra power, could damage the servos if the batter could supply enough juice. The FS90 is a 9 g analog servo from FEETECH (formerly known as Fitec) which is similar in form and function to the Towerpro SG90. The specifications state that this servo has a 120° operating angle for standard servo pulses between 900 µs and 2100 µs. As with most servos, the pulse range can be expanded to achieve an expanded operating angle, but the limits of which are not specified by FEETECH. From this answer to Power supply circuit for powering SG90 servo. 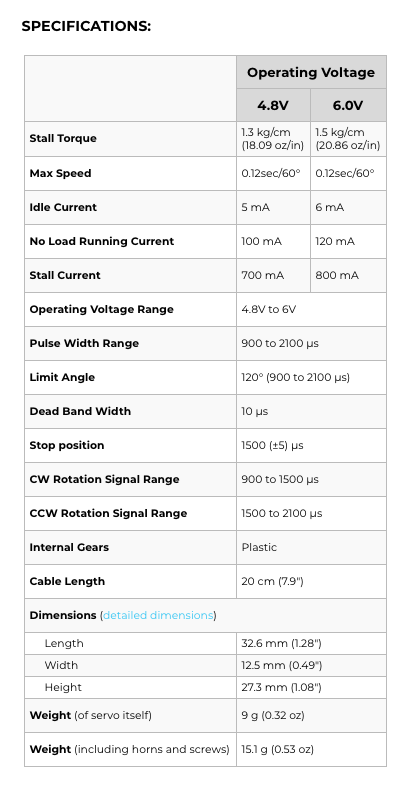 How to handle high current requirements?, lets assume each servo (best case) needs 250 mA, as you state that the load per servo is relatively low. Let's say that the Nano requires 280 mA, see this answer to What is the maximum power consumption of the Arduino Nano 3.0? You probably want more than that, so get a 5 V 5 A supply to be on the safe side. So, no, a battery will not suffice. Cheapest way is that you should buy couple of LM7805 wire it in parallel now power arduino and other servos from this 7805. Connect pwm pins of servos to the nano. Voltage regulator built inside arduino cant provide much current to all servos. Also connect ground of all of your power sources together. Servos don't use PWM, not really. What they need is a pulse that is ~ 1mS wide every 20mS (50 Hz) to turn full one direction, ~ 1.5mS wide to be centered, and about 2mS wide to turn fully the other direction. Or centered, +/- ~ 60-75 degrees or so. (0.9mS to 2.1mS per the data above). Not the answer you're looking for? Browse other questions tagged arduino-nano servo or ask your own question. What is the maximum power consumption of the Arduino Nano 3.0?